If flowers and foliage can be said to speak, it is surely through the voice of botanical illustrators. Our Painted Botanicals journals feature images of orchids, wisteria, lilies and daisies, rendered by some of the finest illustrators in the history of the field. 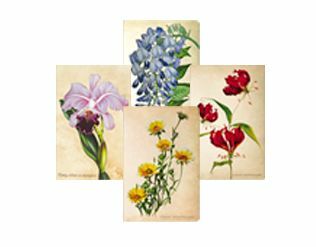 For centuries, horticulturalists and illustrators have worked with scientists to document plants species, most often in watercolours. Renowned among these artists were Sir Joseph Paxton (1803–1865) and H.G. Moon (1857–1905). Paxton, who published a famed periodical containing the original Brazilian Orchid and Blooming Wisteria images, was a celebrated horticulturist. His published collections were greatly prized for their remarkable hand colouring. Moon, the artist behind our Gloriosa Lily and Woodland Daisies, was famous for his naturalistic arrangements and his ability to create lifelike paintings.